With the tide beginning to turn against Germany following the comprehensive defeat of the Luftwaffe by the Royal Air Force during the Battle of Britain, U-boat chief Dönitz was desperate to have as many of his already small fleet out amongst the Allied convoys. Prien and his crew were only spared a fortnight's leave, and on 14 October were once more on their way to the cold waters of the North Atlantic. 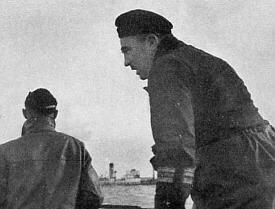 On 19 October, Prien sighted the convoy HX-79, en route from Liverpool to Halifax, Nova Scotia. He was soon joined by four other boats, which then proceeded to join Prien in what was a concerted attack on the enemy procession. Prien's first success came late on 19 October, when a torpedo found the underbelly of the Dutch steam freighter Bilderdijk. This was followed by an attack on both the British tanker Shirak and the motor freighter Wandby. While the Shirak was quickly finished off by U-48 commanded by Günther Bleichrodt, the Wandby was left mortally wounded, eventually sinking two days later. This furious all-out assault continued into the small hours of the following day, with U-47 turning on three British vessels in the space of just under two hours: the freighters La Estancia and Whitford Point, and the tanker Athelmonarch. While the tanker was able to escape further punishment, the two freighters quickly made their way to the ocean floor. Fresh out of torpedoes, U-47 was ordered back to port, arriving on 23 October. The boat had been at sea for a mere ten days, by far the shortest of its combat patrols up to this point. Although Prien had claimed four enemy ships for a total of 22,014 tons, the propagandists back in Germany had credited him with eight ships for 50,500 tons, which - according to the propagandists, at least - took him over the magical 200,000 ton figure. 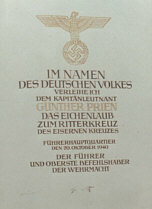 This was to reach the ears of Hitler, who sent a telegram congratulating Prien on reaching this "milestone". 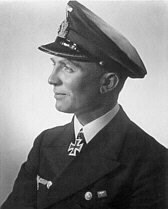 After the successful assault on convoy HX-79, Prien returned to Germany to collect the Oakleaves to his Knight's Cross - he was the fifth to receive this award, and the first from the Kriegsmarine. Three contrasting images of the skipper of U-47. Left to Right: i. Kapitänleutnant Prien after his being awarded the Knight's Cross in Berlin in October 1939. ii. An official postcard portrait. iii. 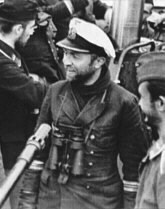 Unshaven in traditional U-boat leather jacket, after a successful patrol. "Wir haben ein Gast an bord!" On 3 November 1940, just over a year after his success at Scapa Flow, the Kriegsmarine's newest Oakleaves recipient once again departed friendly shores. 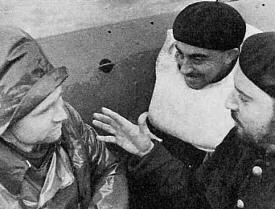 In addition to its regular crew, U-47 also had on board a journalist, Wolfgang Frank - whose job it was to provide an inside view of life on a submarine for enthusiastic readers back home in Germany - a role not dissimilar from that of Lothar-Günther Buchheim, the author of the classic novel Das Boot. While on the one hand Prien didn't shirk from receiving praise - much of which was richly deserved - he consciously avoided inflating his own achievements and reputation. Having got to know the famous U-boat commander, Wolfgang Frank himself confirmed this view, going on to say that Prien found much of the fawning adulation mildly amusing. 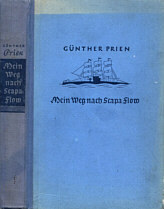 In 1942 Frank went on to write a book of his experiences on board U-47, entitled Prien greift an - "Prien Attacks", which was later published in English with the title Enemy Submarine. Within a week of departing from Lorient U-47 had located what it thought was its first target - the Portuguese steam freighter Gonçalo Velho, which was damaged by deck gunfire. Realising that the vessel was a neutral, Prien let it carry on its way. This brief foray was a prelude to a long period of inactivity, which lasted the best part of a month - ironic, especially when one thinks that the journalist on board would have had to spend almost a month with nothing interesting to write about save the unhelpful weather conditions. The frustrating barren spell finally came to an end on 2 December when the knives were turned on another Liverpool-Halifax convoy, HX-90. Accompanied by six other boats, U-47 laid into the convoy, but the results were, by Prien's high standards at least, fairly ordinary. 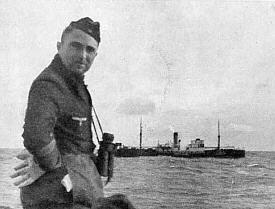 A successful strike was made against the Belgian cargo vessel Ville d'Arlon and a hit was recorded on the British motor tanker Conch (which was later hit by the Type VIIC U-95 commanded by Gerd Schreiber and then finished off by Kretschmer's U-99), but apart from this the patrol was a disappointment, not only to Prien and the crew of U-47 but also to the visiting journalist. U-47 finally rolled into dock on 6 December, and the bad mood of the crew following this dismal ninth patrol was no doubt assuaged by the promise of home leave over Christmas and an overhaul of the submarine. Although still seen by the propagandists as the original U-boat "ace", Prien was to see his long-held position of "king of the aces" taken by Otto Kretschmer, whose U-99 was (mistakenly) credited for over two-hundred and fifty thousand tons.